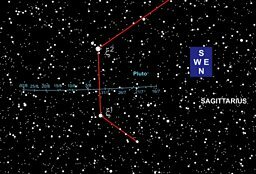 Pluto is currently located in the constellation of Sagittarius, the Archer. The easiest way to find it is to look due south at 00:00 BST throughout the rest of July, 23:00 BST by around the middle of August and from 22:00 BST towards the end of August. A low southern horizon and dark sky location is recommended. The bright Moon will interfere at the end of July and August. 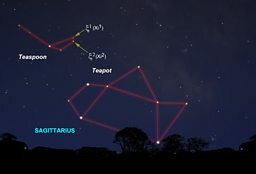 First, try and locate a pattern of stars called the Teapot. This is what’s known as an asterism; an unofficial pattern of stars that looks like a familiar object. 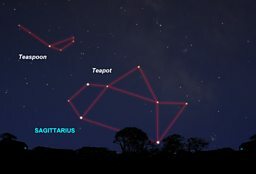 In this case the Teapot asterism does have a striking resemblance to a teapot! The tea making theme is further extended if you look to the north-east or upper-left as seen from the UK. Here lays another asterism known as the Teaspoon. The pattern isn’t as obvious as the Teapot but isn’t hard to pick out. The most obvious part of the Teaspoon is the ’bowl’ of the spoon, picked out by four stars. 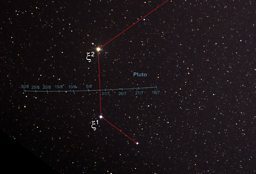 The two marking the lip of the bowl on the west, or right-hand, side of the pattern are the key to locating Pluto. These are known as Xi1 and Xi2 Sagittarii. 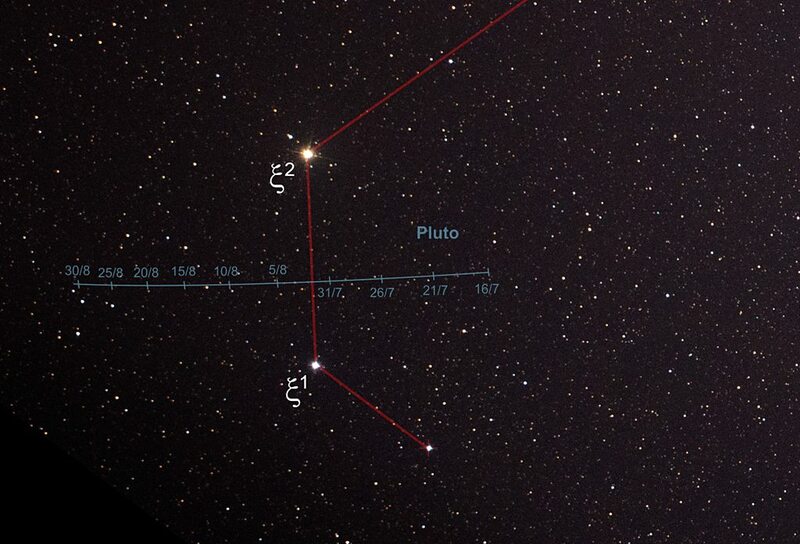 The chart shows a telescopic view (south appears up and east to the right) of the region around these two stars. As the Milky Way runs through this part of the sky, there are a lot of faint background stars. Pluto looks just like one of these! Charts are a great way to locate things in the night sky but they can be a bit confusing when there are lots of faint stars. 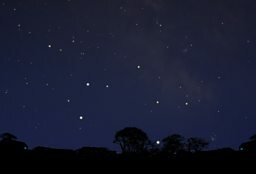 So to give you a better chance of identifying the area the next image is a photograph showing the same part of the sky. The best way to locate Pluto is to use a photographic blinking technique. For this to work, take a photograph of the area on a clear night and follow this up with another photograph of the same area separated by at least 24 hours, or preferably, by a few days. Line the photos up in a layer-based graphics editor and blink the upper layer’s visibility off and on. 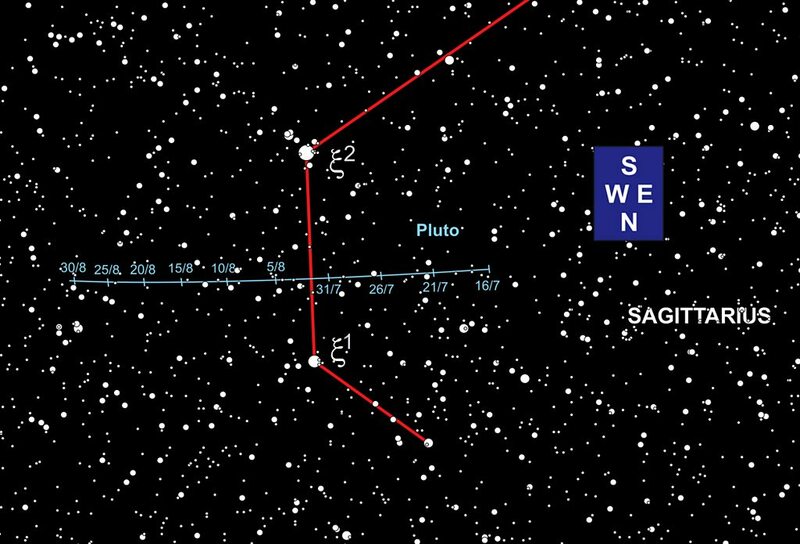 If you see a small dot moving between the shots in the region indicated by our charts, that’s very likely to be Pluto!